a chance at economic opportunity in the US. Surprise, Arizona. 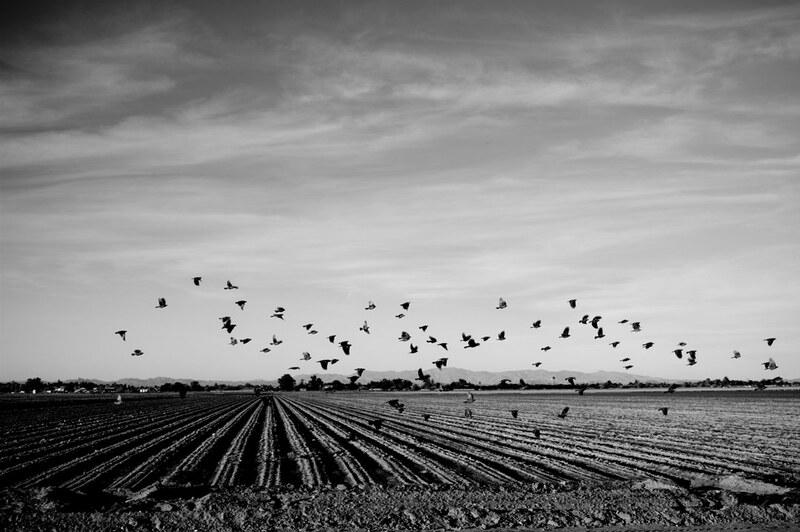 USA 2013 – Birds fly through crops in Surprise Arizona. Surprise, Arizona. USA 2013 – Jose a worker with Miedema Produce, Inc. Cuts fresh relish to taste how spicy it is. Kinston, North Carolina.September 2011. After clearing a field pickers take a break. Sweet potato pickers load trucks with potatoes as they pick through a field. The workers get paid for each bushel which earned them $.40 per bushel and a bushel weighs about 35 to 40 pounds. 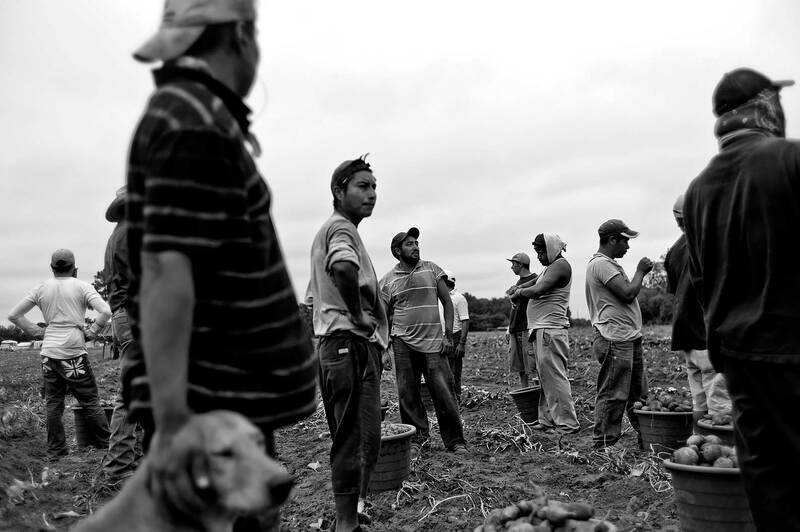 Workers earn about $48 to $60 per day after picking through a field. Some of the workers are as young as 18 and as old as 70. Dudley, North Carolina September 2011 On September 18, FLOC members, community leaders, and activists came together for a rally to officially release a report and call on the tobacco industry to take action to end human rights abuses in their supply chain. Phoenix , Arizona. USA 2013 – Fernando Lopez is a Day Laborer who used to work the fields. He now looks for work at the Home Depot. Mr Lopez supports his family in Mexico buy sending them half his pay check which.sometimes amounts to not thing. 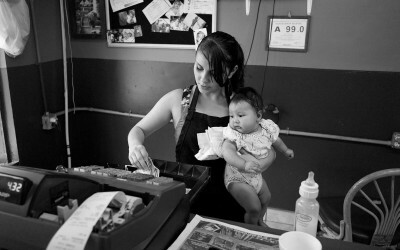 Almost all the day laborers in Arizona are Mexican workers. 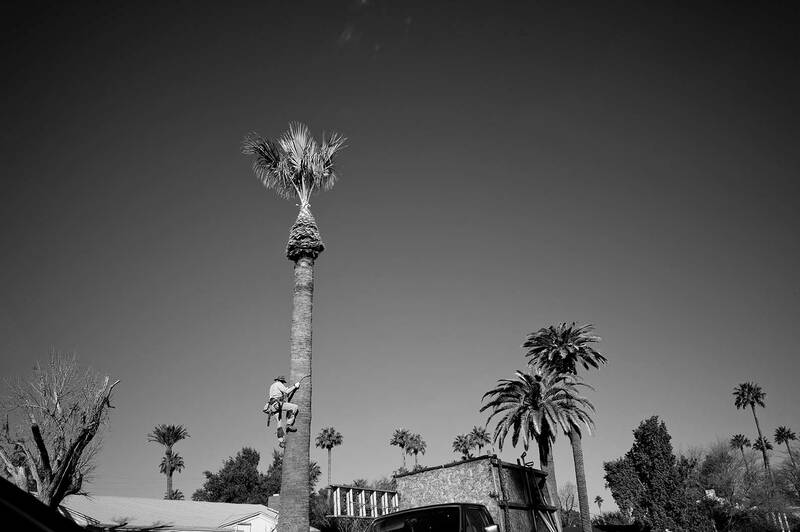 Phoenix , Arizona. 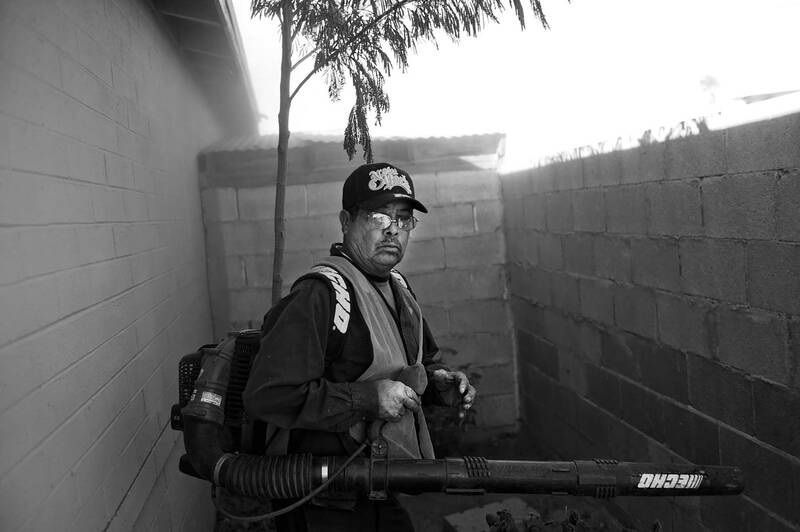 USA 2013 – Mr. Pedro Fuentes is a day laborer in his 60s he is now almost retired but still likes to work. Mr. Fuentes started working the fields at a very young age and left to work as a day laborer. 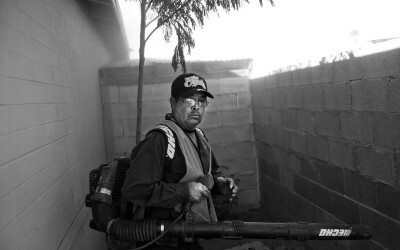 Almost all the day laborers in Arizona are Mexican workers. Nogales, Sonora, Mexico. 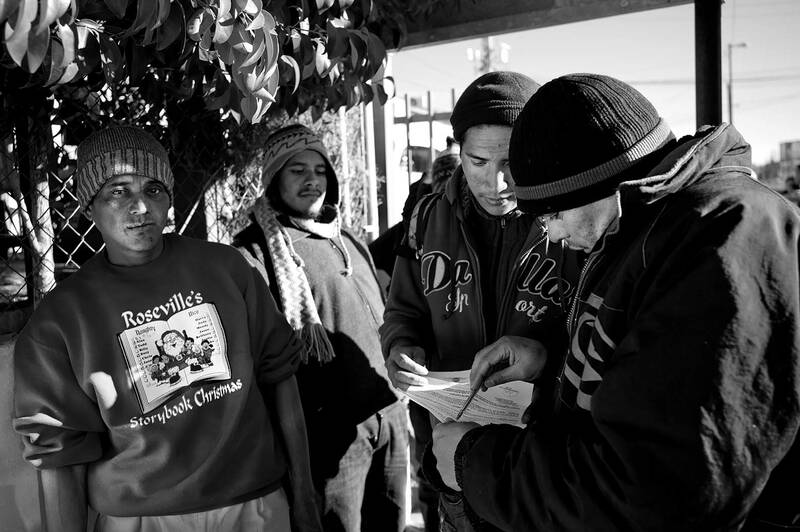 2013 – Migrants arrived at the Aid Center for Deported Migrants or (CAMDEP) to get a warm meal or clothing. (CAMDEP) provides migrants who recently were deported from the United States a warm meal for three days after arriving to the shelter. The feeding center is run by Sr. Alma Delia Isais and a group of volunteer seniors citizens who feed and welcome migrants back home to Mexico. The CAMDEP is located in Nogales, Sonora, Mexico, just across the border from Nogales, Arizona, in the United States. Together, the two cities are known as Ambos Nogales, which means ?Both Nogales.? It is not uncommon for people to live on one side of the fence that now divides the community, and to work on the other. Clinton, North Carolina September 2011 Rodrigo Martinez gives his roommate Jesus Garcia a haircut. Nogales, Sonora, Mexico. 2013 – Migrants arrived at the Aid Center for Deported Migrants or (CAMDEP) to get a warm meal or clothing. (CAMDEP) provides migrants who recently were deported from the United States a warm meal for three days after arriving to the shelter. The feeding center is run by Sr. Alma Delia Isais and a group of volunteer seniors citizens who feed and welcome migrants back home to Mexico. .The CAMDEP is located in Nogales, Sonora, Mexico, just across the border from Nogales, Arizona, in the United States. Together, the two cities are known as Ambos Nogales, which means ?Both Nogales.? It is not uncommon for people to live on one side of the fence that now divides the community, and to work on the other. 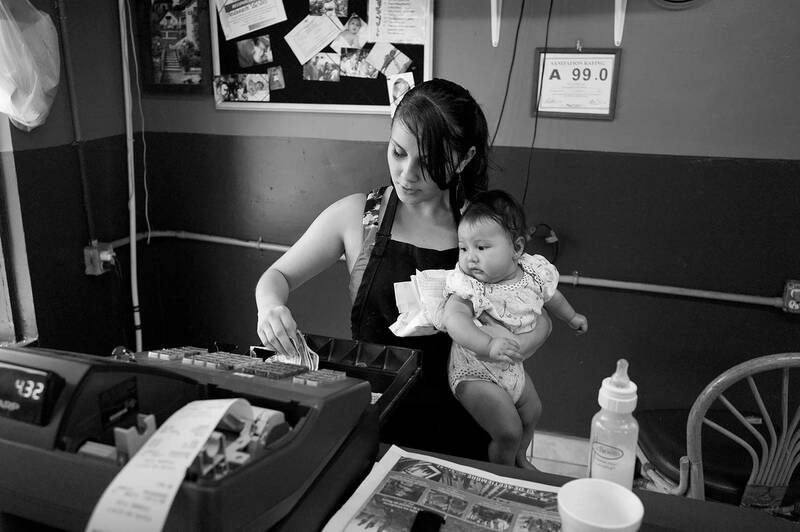 North Carolina September 2011 A young woman holds her niece as she works the cash register at her parents restaurant. 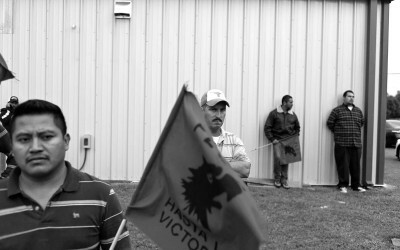 Dudley, North Carolina September 2011 Frank Velazquez a community organizer with FLOC talks to farm workers. 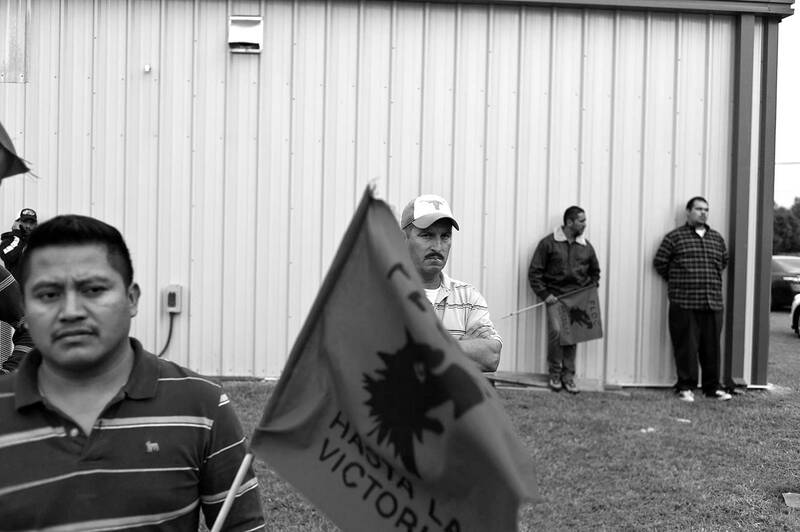 On September 18, FLOC members, community leaders, and activists came together for a rally to officially release a report and call on the tobacco industry to take action to end human rights abuses in their supply chain. 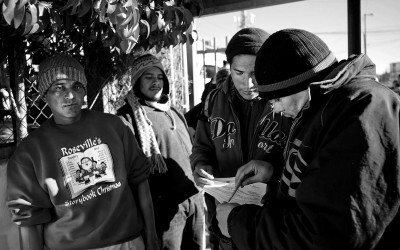 Dudley, North Carolina September 2011Frank Velazquez a community organizer with FLOC talks to farm workers. On September 18, FLOC members, community leaders, and activists came together for a rally to officially release a report and call on the tobacco industry to take action to end human rights abuses in their supply chain. 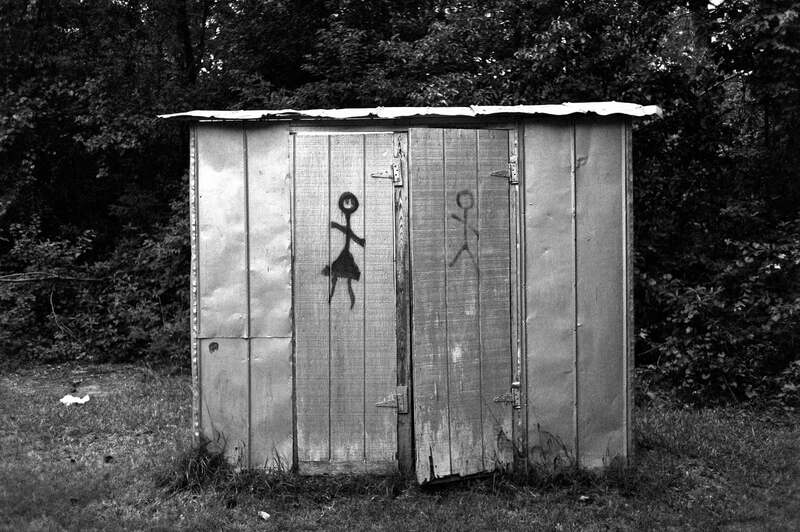 Clinton, North Carolina September 2011 A bathroom for workers at their labor camps.The bathrooms aren’t like Porta potty’s with no running water. Clinton, North Carolina. September 2011 Migrant workers relax after working a 12 hour work day. On average they workers make about $65 a day from picking tobacco or other crops. 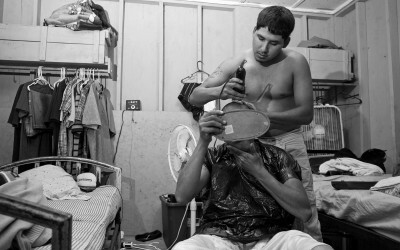 Migrant workers in North Carolina. Phoenix , Arizona. 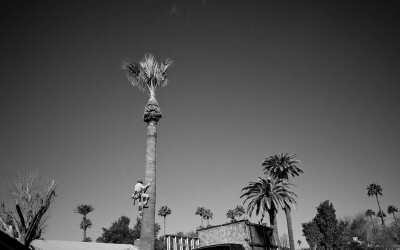 USA 2013 – A Day Laborer climbs down from a tall palm tree. Day Laborers make about $60 to $100 per tree. Most of the workers don’t have insurance and they have to buy their own trucks and equipment. .Almost all the day laborers started working in the fields picking crops , planting and cleaning fields. 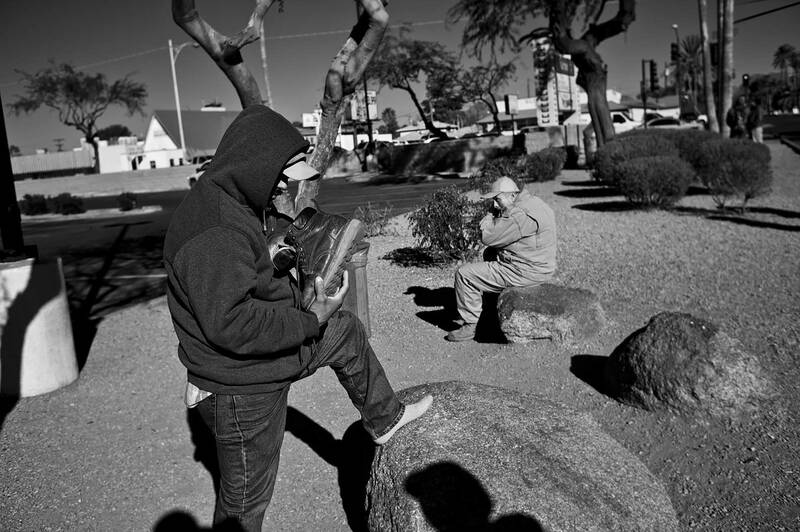 Almost all the day laborers in Arizona are Mexican workers. Nogales, Arizona. 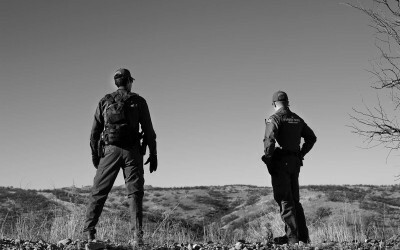 USA 2013 – US border patrol agents looks for tracks left behind by migrants who cross into the United States from Nogales, Sonora, Mexico, into Nogales Arizona. Nogales, Arizona. USA-2013 The border fence between Mexico, on the right, and the United States, on the left. The fencing is about 18- to 30-feet-high. The US government spent $2.4 billion to build 264 miles of pedestrian fence and 226 miles of vehicle barriers in the years 2004-2009, the Government Accountability Office reported in 2009. The literature and images of migrant workers have become part of our rich American history. From John Steinbeck’s Of Mice and Men, Dorothea Lange’s iconic image of the “Migrant Mother” and César Estrada Chávez’s legacy as a farm worker, labor leader, and civil rights activist, my childhood memory is just one small piece of a long struggle. Immigration and the need for labor are inextricably connected. By the early 20th century, American cities were growing dramatically and more agriculture was needed to meet expanded needs for food. Congress passed the Immigration and Nationality Act of 1917. 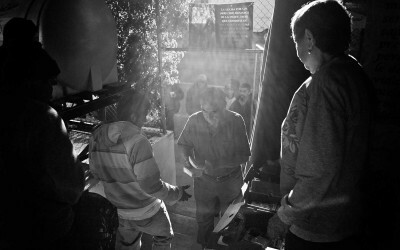 This law established a legal basis for the importation of some 73,000 Mexican workers. During the Great Depression, foreign demand for agricultural exports plummeted and prices dropped. 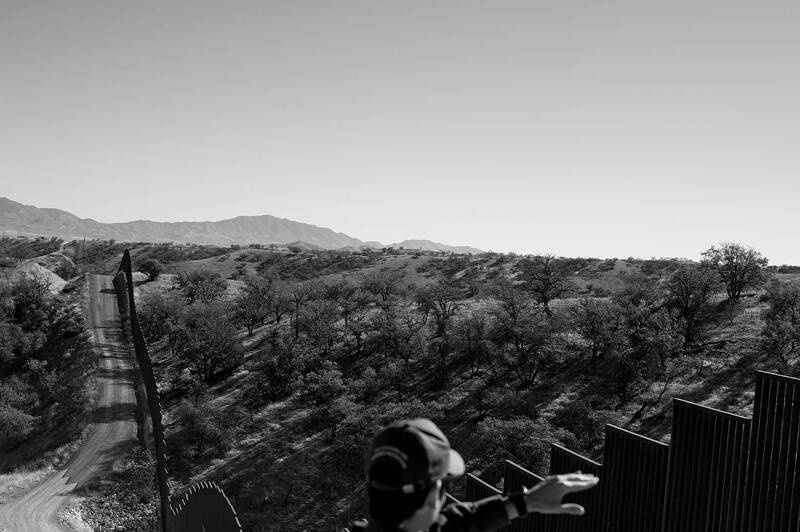 In an effort to open up jobs to native-born citizens, the Immigration and Naturalization Service cooperated with local authorities to deport more than 400,000 ″Repatriados” back to Mexico in the 1930s. At least half were U.S. citizens, mostly the children of immigrants. Generations later, the situation remains very similar. More than eight million undocumented workers, who comprise five percent of the work force, are embedded in the American labor market. Many risk their lives to cross the border; many die on their way, while others are caught by the US Border Patrol and deported. Undocumented workers face extraordinary economic hardship in their home countries, encouraging them to endure these dangers. In 2011, the U.S. expelled nearly 400,000 illegal immigrants (ICE, 2011). It is not surprising that migrants often work in the most undesirable occupations: meat-packing plants, landscaping, harvesting crops; all are low-wage jobs in physically demanding and difficult conditions. Most middle-class Americans would never dream of accepting such toil with low wages and without legal accountability or safety standards. Yet these tasks remain essential, underpinning the basic fabric of the American economy and quality of life. All the while, undocumented immigrants live under the radar with meager wages and poor access to education, social services, and health care. Nonetheless, I have seen how they remain resilient and strive to be part of the American Dream. It is not surprising that migrants often work in the most undesirable occupations: meat-packing plants, landscaping, harvesting crops; all are low-wage jobs in physically demanding and difficult conditions. 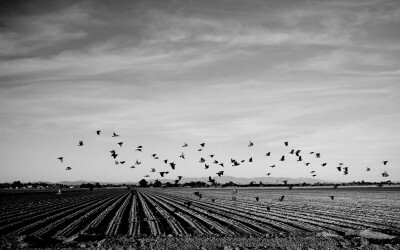 Birds fly through crops in Surprise Arizona.